After two days rest from Mt Owen, it was off again into the hills; the summer highs were rolling in thick and fast now! 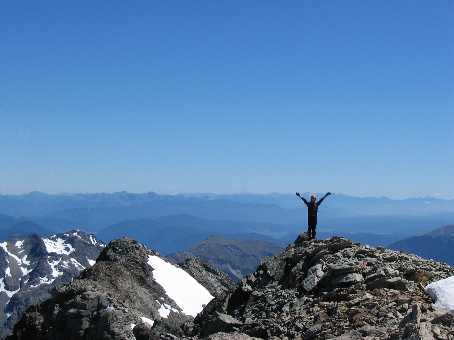 This time it was into Nelson Lakes National Park for Mt Franklin, which is the highest peak by just 6 meters over Mt Travers, commonly thought to be the highest. We were going to climb Mt Franklin as part of the Travers-Sabine circuit, a classic 4-6 day tramp. We left St Arnaud on a misty, drizzly Sunday. Couldn’t see much but great conditions for a nice cool walk through the beech forest. Despite the wet conditions, the forest was humming with the sound of wasps, a major concern these days in this and other beech forests around New Zealand. 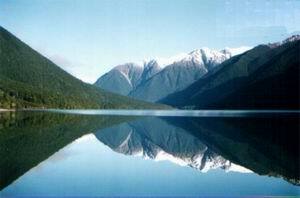 Lake Rotoiti though was looking stunning this morning; glassy like a mirror with the far shore fading into the mist. We had lunch at Lakehead Hut, and then had a pleasant afternoon stroll up the Travers valley to our stop for the night, John Tait Hut. Much to our surprise we were to share the hut with only one other; we had been told that it was peak season and this was a popular tramp. The forecast for the next day wasn’t good and we woke to cloud and mist, but as we made our way up the Travers valley the cloud lifted to reveal the vivid blue of a clear sky. Gotta love that eh! We were a bit disappointed when we got to Upper Travers Hut knowing that we were just passing through. The hut is set in a stunning location above an alpine meadow, surrounded by mountains and looking down the Travers valley. Only 1-1.5 hours from Travers Saddle it’s positioned to set you up to make the most of a cool morning before the sun really hits or the weather closes in. It was late morning when we left Upper Travers Hut so the sun hadn’t fully hit yet, and thanks to a light cool breeze, the going was sweet. We soon arrived at Travers Saddle to amazing views all round, especially of the eastern side of Mt Franklin. There was still a lot of snow around up there! Not good news for us as we had gambled to go light and only had ice axes and shoes; no solid boots nor crampons. We had some lunch and soaked in the views before we started our descent into the East Sabine and onto West Sabine Hut, a descent of over 1000m vertical. The track descends quite steeply after awhile following an avalanche path. We were very thankful for our walking poles at this stage, and we were to find out later that many other people had struggled with their knees over this long descent. If you ever plan to do this the other way in summer, start early as you’re out of the trees early and it would be a scorcher once the sun really got up. And take your poles as you arms may as well do some work. You have been warned!! We dived into the river as soon as we got to West Sabine Hut. You gotta love that eh, and as someone pointed out that night, how many places in the world can you swim and drink the water at the same time?!? Our third day was a bit of a “rest” day. A sleep-in, a gentle 3 hour stroll up to Blue Lake Hut, a bit of a scout around, and lots of eating were the only things on our plans. Blue Lake Hut is another one of those places where it would be easy to spend an extra day given good weather. There are walks to Lake Constance or Moss Pass, or one could watch the world go by at Blue Lake, which certainly lives up to it’s name. An icy dip in it’s waters is a quick cure for sore legs and over-heating bodies. It was a scorching afternoon when we walked up, so the dip was just blissful. To access My Franklin we wanted to get up into a high scree basin to the west of the summit. The route we had read about said to go through the trees from the outlet of Blue Lake to the true left side of the creek/gorge that drains the scree basin, and from the bushline to climb through steep tussock into the basin. But the trees looked thick and the going slow, especially in the dark of morning, and the steep tussock certainly looked that way. We scouted what looked like an easier and faster way; up towards Lake Constance, northwest around the rim of the moraine wall, up a wee scree slope to gain a large tussock ledge that hopefully would lead north into the scree basin. We couldn’t really see anything else so we’d just have to make it up the next day as we went along. 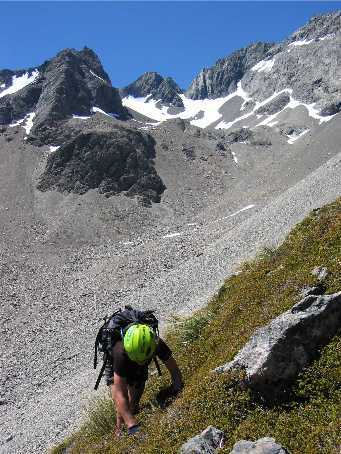 The route guide we read had said from the scree basin to climb up through steep scree and bluffs to the south saddle, where easy rock climbing would lead onto the south shoulder then a broad ridge to the summit. It all depended on conditions really, especially the amount of snow. Next morning we awoke to a sky of stars. Wicked!! After having a sneaky breakfast, trying to eat and get ready without waking up everyone else in the hut, we were off half an hour before light, planning to leave the track right on first light. Our route proved to be sweet, and we were in the high scree basin in no time. From there we eyed two possible routes; the route to the south saddle looked clear of snow but was on quite steep loose rock, and a route to a northern saddle which had snow on it but was a much easier angle. With a good freeze that night and no crampons, and not knowing what was beyond the northern saddle, we opted for the south saddle, keeping the northern side in mind as a descent option for when the sun soften the snow. 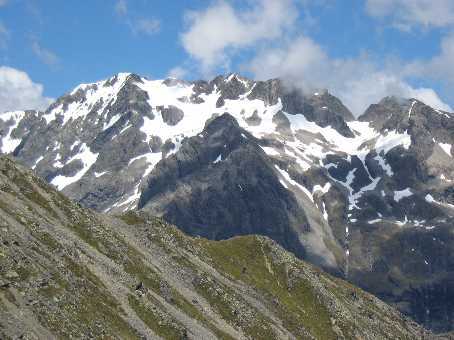 The south saddle route is reasonably straight-forward, but definitely not a tramping route or even a alpine pass route. Some climbing experience in the group, a good head for heights and good weather are key. A helmet is also essential. After an hour or two of scrambling over steep scree, loose rock and some snow, we were on the summit. Hardly a breath of wind, not a cloud to be seen, and views as far as Mt Owen, Tasman Bay, Mt Tapuae-O-Uenuku, and even Aoraki/Mt Cook! 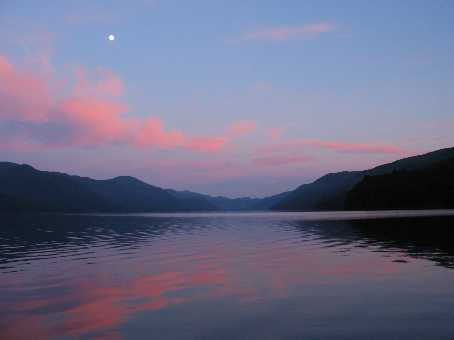 Pure Aotearoa magic! Not wanting to down climb loose rock or steep scree, we ventured north in search of the north saddle. We found that you can easily drop onto the snowfield on the northwest side and follow it around and up into the north saddle. From there it was a gentle stroll and a bum-slide or two down into the scree basin we started in. Given you had either crampons or no snow on the route, this would definitely be an easier way up and is less exposed than the south saddle route. We were back at Blue Lake Hut after almost 11 hours on the go, a refreshing dip in Blue Lake our prize. 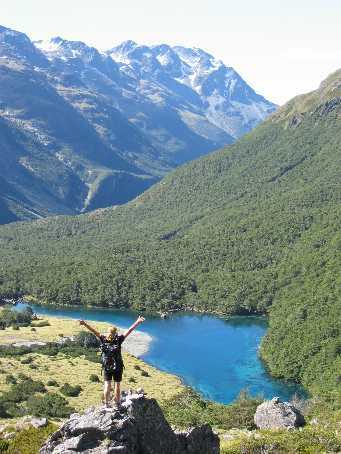 The fifth day was down the entire Sabine valley to Sabine Hut on the shores of Lake Rotoroa. It’s a beautiful valley and it would’ve been a rather pleasant walk had it not been for the fact that it was yet another scorcher of a day and it was 27 degrees in the trees, in the shade! Who knows what is was in the clearings, we didn’t stop to find out. We swam at every rest stop, and finally at Lake Rotoroa which felt like a hot spring after Blue Lake. Back into sandfly land, we had an amazing sunset and sunrise that night. Check out the view from the jetty when you’re there. The final day follows the track back into the hills to Speargrass Hut and onto Mt Robert carpark. There is a bit before Speargrass Hut where it’s boardwalked for ages over fragile sub-alpine terrain, and it breaks out onto a viewing area. Yet another place with incredible views. How much can one take on one trip?!? Peter from Nelson Lakes Shuttles picked us up from the carpark and it was suddenly back into civilisation. The Travers-Sabine tramp is a fantastic trip, and justifiably popular. You might want to go late season (March-May) if you want to miss the crowds, although we went late January and it wasn’t that bad at all. It’s all luck really; some nights we were there the huts were almost full, the next night empty. The track crosses several avalanche paths so it’s not recommended in the winter or early spring unless you know what you’re doing. One alpine pass can become two if you decide to cross Moss Pass and walk down the D’Urville valley instead of the Sabine, and it would only add an extra day. Some locals told us that Moss Pass was THE place to go. So big ups to Peter from Nelson Lakes Shuttles for his support, and to Aotearoa; go you good thing go!